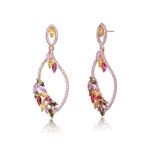 Women's drop earrings add something special to every lady's attire. How many times have you seen a woman dressed up with diamond dangle drop earrings and thought, "Wow, she looks stunning!"? It's the diamonds that add an extra sparkle that many people often overlook. Whether you are looking for round brilliants, princess cut, or traditional baguettes, Diamond Essence will deliver quality every time. Our women's drop earrings feature elegant designs and showcase a few colored gem styles such as ruby and sapphire essence. These faux diamond earrings are sure to deliver a touch of class to any outfit from ball gowns to sophisticated cocktail dresses. If you are looking for a pop of color in your outfit, the emerald drop earrings are sure to impress even the most discerning eyes. Choosing the perfect outfit can be tough but selecting the right faux diamond earrings is simple. We carry over 100 different styles of simple diamond drop earrings including stunning colored gem options to choose from. When you take a look at our products, you'll be impressed by our affordable prices. With costs between $69 and $129, you can’t go wrong! 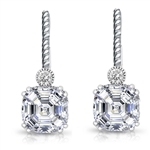 Need help selecting the diamond drop earrings? Give us a call toll free, at 1-800-909-2525 or email at info@diamondessenc.com. Free & fast shipping available!